When you think about vital organs in your body there are a few that may come to mind first, such as your heart, lungs or brain. Who could live without those, right? Well, here is another one you should be sure to remember. Your liver. Your liver is one of the largest and most important organs in your body. It detoxifies the blood and performs numerous vital functions, including: the production of clotting factors, blood, proteins, bile and more than a thousand different enzymes, the metabolism of cholesterol, the storage of energy to fuel muscles, maintenance of normal blood sugar concentration, the regulation of several hormones and the detoxification of drugs and poisons. A healthy and well functioning liver is vital to overall health and wellness. Even simple, everyday occurrences such as: fertilizing your lawn, cleaning your bathroom, eating fatty foods or taking prescribed or over-the-counter drugs can all contribute to an overworked liver and expose your body to a variety of dangerous toxins. Excessive exposure to certain toxins or poisons, including alcohol, can lead to liver damage. 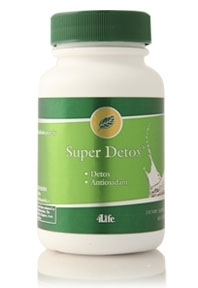 Super Detox Formula is blended to address the unique needs of liver health and the body’s natural detoxification process. It includes a combination of antioxidants for added protection and health support.